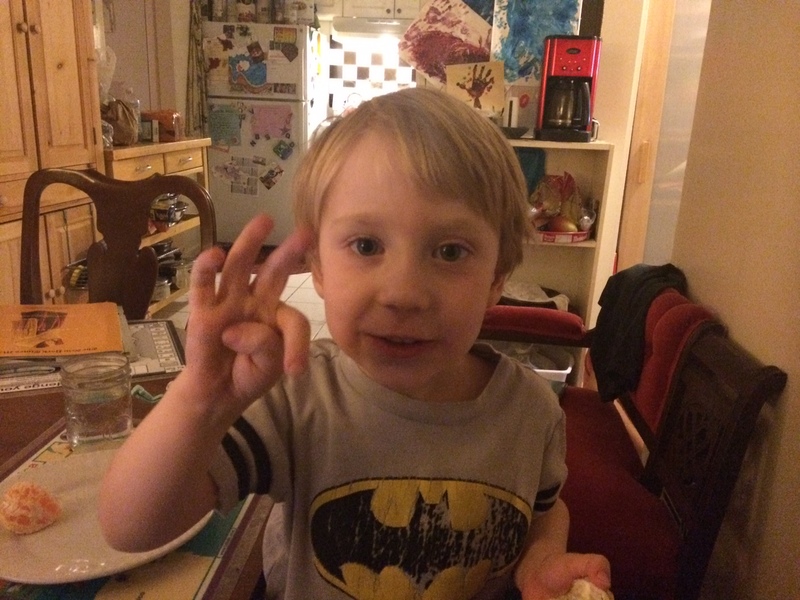 Timon, who is 3 years old, holds up 2 fingers on the same hand. Timon says quickly, without any obvious counting with his fingers, “Five!” and then holds up all five fingers on one hand. Here, I notice him counting on rather than counting from one. “What if Grandma comes too?”, I ask. And then he’s done with this game and moves on. Later I ask him again how many people are in our family and he holds up five fingers, looks at them and says, “I need to take one away. Four people” and folds his thumb up next to his hand. This is the use of three different representations of numbers from 1 through 6, specifically the oral naming of the numbers, the use of his fingers to show the numbers, and then actual number of people being represented, and Timon is moving between the three representations fluently. But he’s also only doing this for the first six numbers and I know that he doesn’t know the symbols for these six numbers yet. I’m also not sure yet that in every instance of these numbers appearing around him that he’s as fluent as when he is counting people. 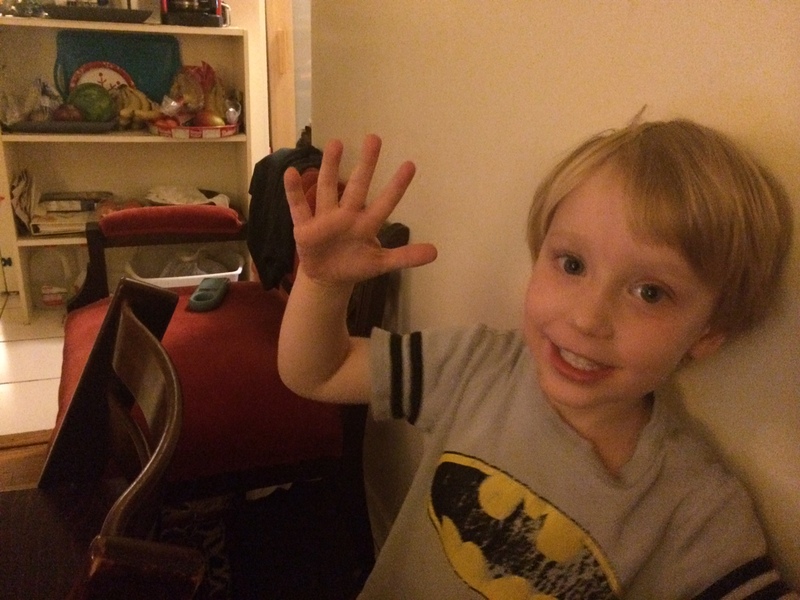 And as I recall with my older son, he was fluent with counting people before he was able to count other things. I especially noticed this interaction because this is the first time I have seen him move between number representations greater than 4 things so effortlessly. 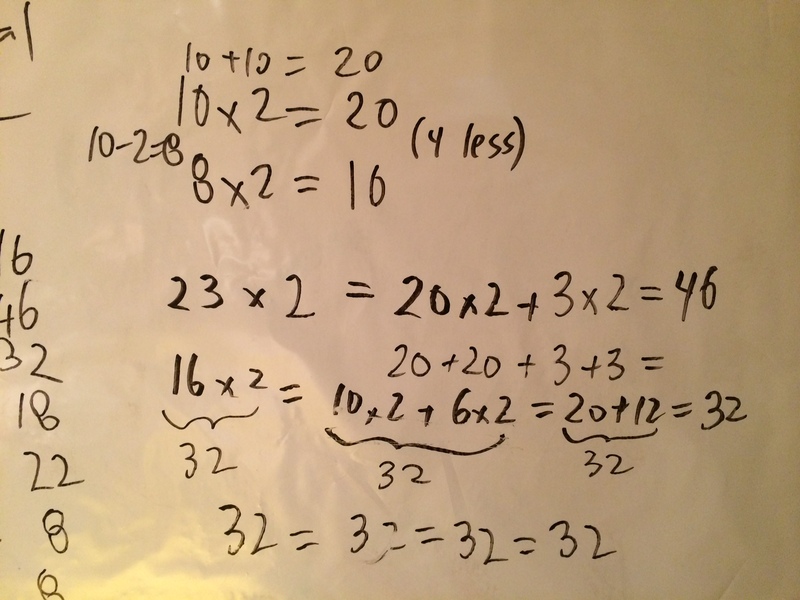 Recently I ran a math class for a few younger students, including my son. The objective of this class were to start making connections between how students visualize numbers and early arithmetic strategies. 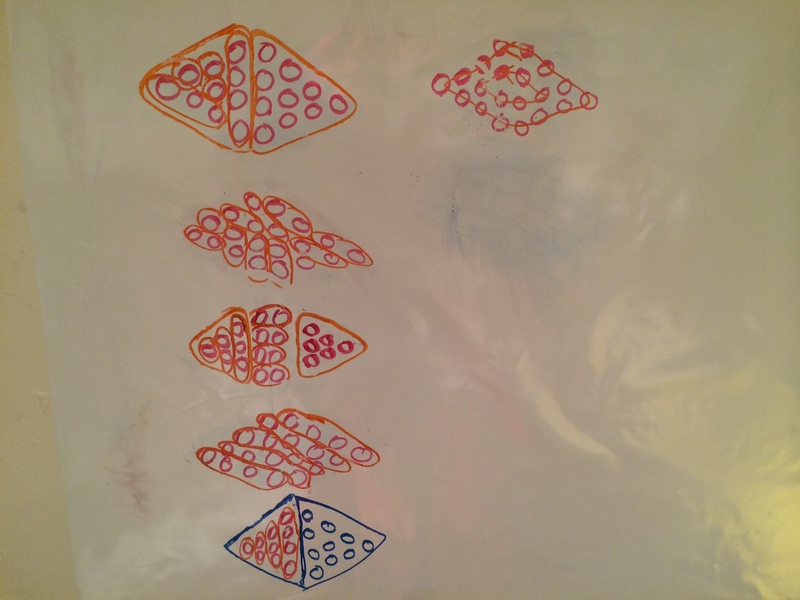 Here are some of the various ways students visualized a group of dots to figure out how many total dots there were. Here are some of the strategies students used when they doubled numbers in their pattern. I asked students to look at the visualizations for the dot patterns and the arithmetic patterns and see if they noticed anything in common between the dot visualizations and the doubling strategies. They didn’t. One student said that in both cases, the students counted in order to find the answer, which was true. In both the dot visualizations and the doubling strategies, one strategy at least some students used was counting. Another student said that in the dot pattern and the doubling strategies, we were trying to duplicate something. Not everyone knew what he meant by duplicating, so he explained it again, and I revoiced him and used the word doubling, which everyone understood. In the first one, in order to figure out 23 x 2, first we do 20 x 2 and we save the 3 to figure out later. In the second one, first we counted the perimeter and saved the inside shapes for later. I’m excited by this observation as I had never thought of thinking of the distributive property as “saving part of the calculation” for later (although I have often seen other visualizations of the distributive properties). Last night I had an interesting realization about my son’s understanding of place value. It is clearly incomplete. We were continuing our made-up story about Max, the 701 hundred year old 7 year old. He was cursed at the age of 7 to never age and to never die, and now he is 701 years old and working hard with his friends to try and break the curse. At one point Max gives an explanation of curse to the sea elf king in order to ask the king for help and Max says how many years old he is. I left the actual number of years Max had been alive out of the story though and so my son filled it in. “Max has been alive for six hundred and four years,” my son said. “Oh, how did you get that?” I asked. “Six hundred and three plus seven is seven hundred, so six hundred and four plus seven is seven hundred and one,” my son replied. He spoke so confidently and assuredly that I did not correct him. Also, I wasn’t totally clear at that time exactly at that time what he was thinking, and it was late. I think that he was regrouping the ten and confusing a regrouped ten as a one hundred. He did the same thing when he first tried counting on from 100 at age four. I remember quite clearly him counting 100, 101, 102, 103, 104, 105, 106, 107, 108, 109, 200. I also remember how stubbornly he continued with this understanding. I know of some strategies that I can use to continue building his understanding of place value. I am not sharing this story to look for help or a diagnosis but just to point out that a child who the previous night confidently and accurately multiplied 400 by 21 in his head still has unresolved issues with place value. I think my take-away is that I need to be cautious about what assumptions of knowledge I make about my son (and of course the same is true of my students). I had a fascinating exchange with my son last night. I was telling him a made up story, and at one point this character who is cursed and very old said that his age was “Four hundred times a score and one.” My son asked what a score was, and I told him twenty. He then tried to figure out the person’s age. He started by asking what is four times twenty, and I told him he could figure that out. He counted up by fours to get eighty, and then said that four hundred times twenty is eight hundred. He thought for a moment and said that no, it must be eight thousand, which meant the final answer is eight thousand four hundred. This makes me curious about how he understands the number twenty. He knows apparently that four hundred times something is one hundred times whatever four times the something is, although I am not clear he would explain it like that. However, he apparently did not use the fact that twenty times something is the same as ten times two times the something. My son and I were walking back from the park, and he was trying to convince me that I had time to play Clash of Clans, and that I really should start playing it. A woman passed by at this point and overheard our conversation and my question to my son. She stopped to listen. “Okay, so how many halves of one third fit into a whole?” I responded to my son. The woman at this point started to speak, but I said to my son, “And remember the point of this is for you to figure this out yourself.” The woman looked at me and nodded and then stopped speaking. We stopped our conversation about fractions at this point as my son started talking about how in the games of Threes, the numbers aren’t actually multiples of three and the game is misnamed. This is the first time I have heard my son talk about fractions other than thirds and halves. I saw my role here was to find the right questions to ask at the moment that my son has an intellectual need for other fractions. These kinds of conversations are common-place between me and my son, but still every time I am amazed by how much thinking about this he must be doing when I’m not around. This morning we had mini-pancakes for breakfast. 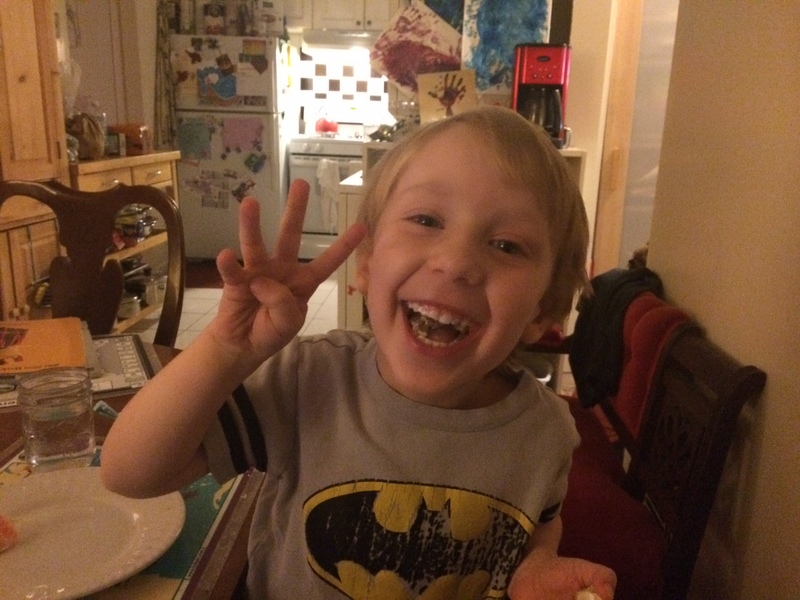 I gave my youngest son (who is two) three mini-pancakes. When he was still hungry, I gave him two more. There is interesting research that suggests, through an ingenious experiment, that we are literally born with some knowledge of numbers. 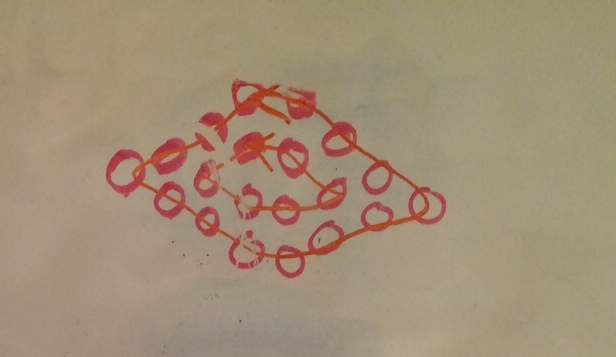 Not symbols, like the word “five” my son is using above, but numbers. 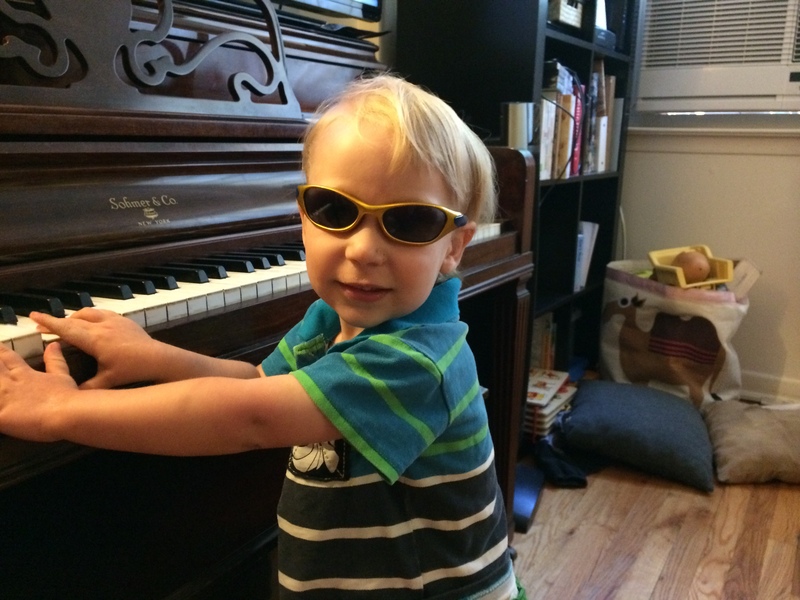 It seems to me that while my son is developing his language, it is an excellent time to develop his innate understanding of number and connect it to the language he is learning. So I pay attention to what my son says and even at two years old, when he is first developing language, we count together, we group objects when we play, and I help him give language to the thoughts he is already having.